The Faulkners were involved in several businesses, although not always successfully. As early as 1 November 1858 Matthew and Robert Faulkner, who were licenced victuallers and cordial manufacturers in Adelaide, had to appear in the Court of Insolvency. George Faulkner was a poundkeeper at Mintaro in 1859. Charles Faulkner had started building his three-roomed hotel The Bushman Inn at Nuccaleena for which he was granted a publican's licence in 1863. When town lots were auctioned, in the recently surveyed town of Nuccaleena on 20 July 1863, Faulkner bought lots 2, 3, 4 and 7 on Cooper Street for the colossal amount of $888.60. Needless to say that he had to protect his hotel site from some unfair bidding. The normal price at that time would have been only $10. 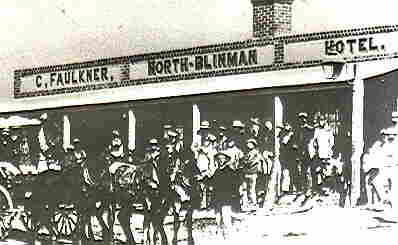 Faulkner ran his hotel until 1869 when he moved to Blinman to build his second hotel and operated it until 1872. When the nearby Sliding Rock copper mine opened, Faulkner moved once more and again built a hotel. Once again he started even before the town was surveyed and land made available for sale. This time though he was lucky. At the first land sales he was able to buy four town lots including the site of his hotel for $125.00. This time Faulkner named it the Rock Hotel. While still living at Blinman Faulkner became part owner and large share holder, 560 in 1872, in the Sliding Rock mine as well as a director. He had even one of the shafts named after him. He also registered several other mining applications but these proved unsuccessful. In 1874 Faulkner bought land in the nearby town of Beltana. This time he paid $15. for lot 23. At the same time Charles expanded his other business interests. In 1875 he rented a building out to the local police for which he was paid $55 in rent annually. This arrangement did not result in any favourable treatment though. When the Faulkner family decided to leave the district, and settle in Stansbury, Charles was shouted many a drink and as a result was booked on 11 January 1877 for being drunk and disorderly. His store at Sliding Rock was taken over by J.W. Duck. Not everything went well for the Faulkner family though. On 20 December 1875 Charles and Margaret lost their seven month old daughter Alice Maud. A few years later when the mine closed for the first time the Faulkner family left the north and moved to Yorke Peninsula. Later that year he also sold his land at Beltana. In 1882, while living at Stansbury, Charles was appointed Justice of the Peace. Charles died on 31 July 1915.